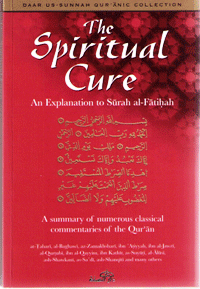 The Spiritual Cure is an explanation to Surah Al Fatihah, a summary of numerous classical commentaries of The Quran. The underlying theme of Surah al-fatihah is one of contemplation and serenity, pondering the Names and Attributes of Allah, pondering the creation and acknowledging that He alone deserves praise and worship, that He alone should be asked/sought for help, that He alone should be feared and hoped in that He alone should be invoked that there is indeed a Day of Judgement and that guidance has come to us and we are required to be firm and consistent on it by the Towfiq of Allah. It calls us to carefully scrutinize our relationship with our Lord, that is, are we living according to the declaration and our covenant with our Lord that ‘none has the right to be worshipped but Allah’ or not? This opening chapter, despite its brevity, calls man to fulfil the rights of Tawheed, the right that Allah has over us to worship Him alone without any partners, in thirty places. This chapter summarises succinctly the message of the whole Quran.